Earlier in the week, Matt W asked if there were any games that took advantage of outputting on more than one screen. 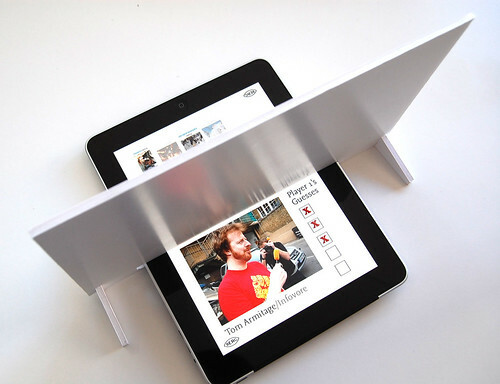 Not necessarily the usage of side-by-side screens to increase the field of view, either – but different screens that perform totally different functions. I pointed out that there was some precedent – although not a lot – and what began as a conversation quickly became a list that was worth sharing and explaining a bit. This isn’t the kind of thing Matt meant. 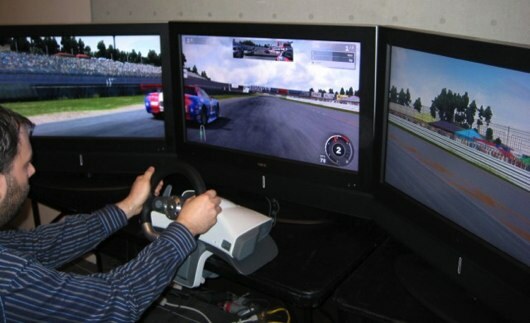 Whilst it’s definitely a part of this conversation, the Forza Motorsport series’ use of multiple monitors to increase the field of view is the kind of thing that’s not actually very interesting. It doesn’t alter the game in any significant way. It’s also a brute force solution: each screen is rendered by its own Xbox, and all the consoles are slaved together over a local network. I think what Matt meant was separate screens performing different functions. At the very simplest level, second screens can act as contextual displays – parts of the HUD or interface broken out to their own display. 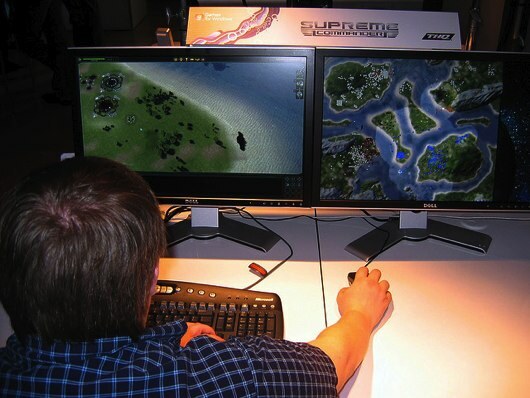 The strategy game Supreme Commander allows players to use a second monitor for a zoomed-out tactical map. Rather than reducing the map to the corner of the screen (as many strategy games do), or forcing the player to constantly zoom in and out, the second screen provides a permanent context for what’s going on the primary screen. A similar type of contextual screen can be seen on the Sega Dreamcast. 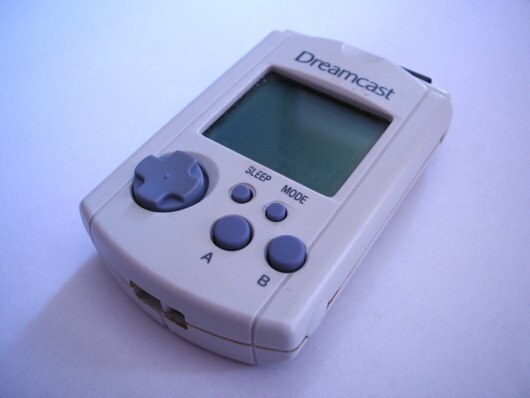 The VMU memory unit was designed as a miniature console itself, with a screen and set of controls. When docked with the joypad, it acted as a second screen in the player’s hands. The VMU was not used as effectively in the role of “second screen” as it might have been, although there were exceptions. Resident Evil: Code Veronica, for instance, used the VMU to display the player character’s health (which was otherwise only visible in the status menu). 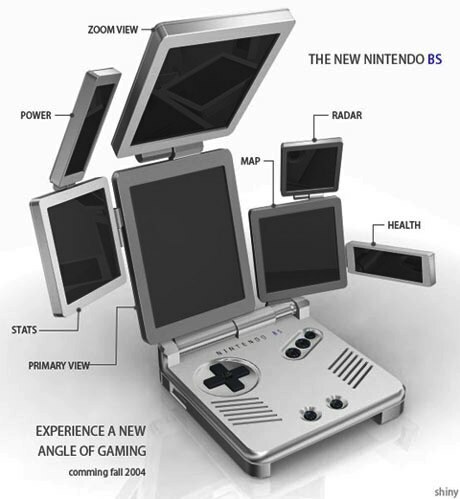 Of course, there’s a limit to how many secondary screens are sensible; shortly after the announcement of the Nintendo DS, the above spoof was widely circulated. It’s a good point: lots of little screens right next to each other aren’t very different from one big screen. 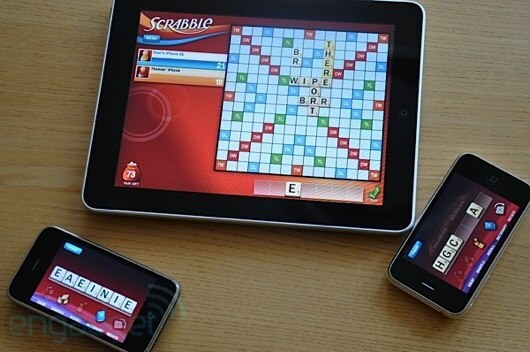 The most interesting usage of multiple screens is in their capacity to affect gameplay itself. What sort of games would you design when players can have different viewports onto the world? Pac-Man VS is my favourite answer to that question so far. 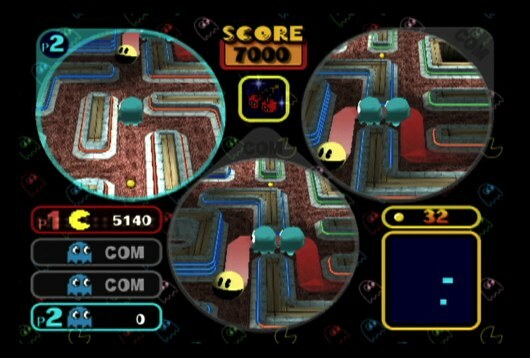 It’s four-player Pac-Man, on the Nintendo Gamecube. Three players play ghosts: they play on the TV, with Gamecube pads.They have a 3D-ish view of a limited part of the map, and a radar in the bottom-right to know where each other is. The Gameboy screen shows the Pac-Man player the entire map. Pac-man’s superpower over the ghosts is context; he has knowledge of the whole map. The ghosts are more powerful, but can’t see nearly so much. 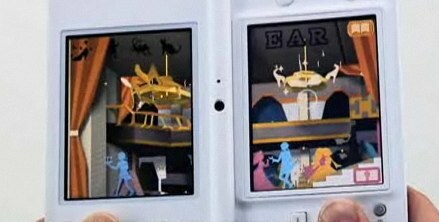 Here’s a nice video of it all playing out, the Gameboy screen on the left, the TV on the right. It’s marvellous: fun, social, and utterly ingenious. 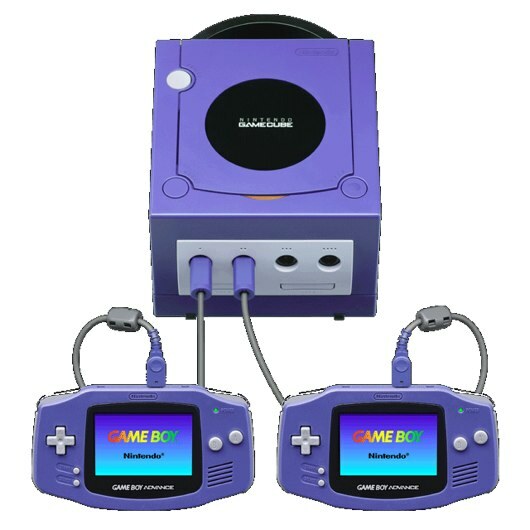 There were a few other games for the linkup cable designed around players having their own screens – Final Fantasy: Crystal Chronicles and Zelda: Four Swords are the obvious examples – but Pac-Man VS remains the stand-out, for me. This imaginary affords all manner of games based on hidden knowledge and incomplete views of the world. And, just like a tandem, it looks wrong without someone else playing with you; it indicates how it wants to be used, inviting a second player. 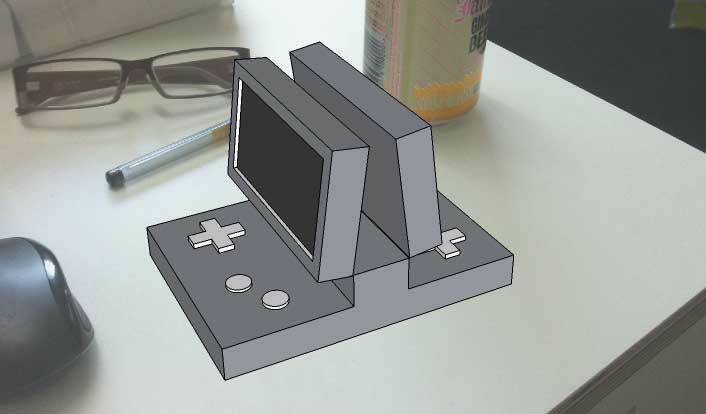 My imaginary console is entirely symmetrical in its design. It’d be a shame to only encourage games that gave symmetrical abilities for both players, in the same way as games like Guess Who? or Battleships. Asymmetric games – where players have very different abilities, or viewpoints, much like Pac Man VS above – are, for me, a more interesting notion to explore with multiple screens. Imagine games where players may have not only very different abilities or tasks to one another, but also might be played on totally different types of screen from one another. Super Mario Galaxy demonstrated a co-operative approach to asymmetric play. Rather than being another avatar in the world alongside Mario, a second player could use their Wiimote to scoop up star bits as they passed. They did nothing else, and could drop in and out when they liked; theirs was a purely additive role. It allows a player with different capabilites – or attention – to drop in and out of the game, always helping, but not being critical to Mario’s success. To extend that idea to screens: what are the gameplay modes for a friend with a touchscreen tablet, whilst I’m playing on a console attached to the TV? Mechanic to my racing driver? Coach to my football team? Evil overlord planting traps in the dungeon I’m exploring? I don’t know yet. This at least feels like the start of a useful catalogue of multiple-screen play. And as screens become smarter, and “screen” and “device” increasingly become synonyms for one another, the world of multiple-screen play feels like an exciting, and ripe area to explore. [An event that brings] together some of the smartest creatives from the digital, gaming, theatre and performance fields, to spend three days exploring where digital tools and the ethos of play will take us next. Ever since I got back from it, though I’ve mainly been asked what the Lab actually was. Now that I’ve decompressed from the intensity of those three days, it’s easier to both write about the event itself, and answer that question. The short video above may provide some hints, but might also just look like a bunch of grownups talking and playing games. It deserves a more detailed explanation. The Lab was a small event, with 10 invited participants from a variety of backgrounds – performers, artists, designers, technical types. 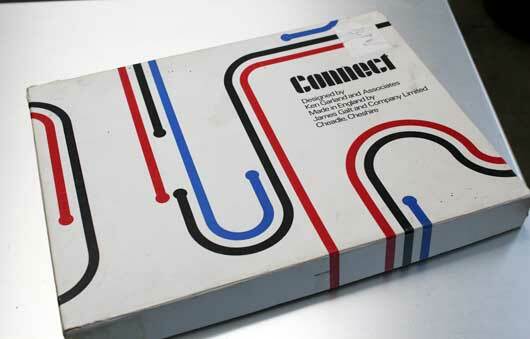 We all were, however, connected by our interest in play or games. Given the tiny size, and that it was invite-only, it doesn’t feel fair to label it as a conference. And though there was a great deal of freedom in our discussions and sessions over the three days, the Lab differed from a conference in that a definite outcome was required: as a group, we had to present “our findings” – whatever they’d turn out to be – in the format of a card game. You could have called it a three-day game-design workshop, except it’s not entirely fair to call it a workshop, either: the format of our conclusion may have been dictated, but what conclusion we were aiming for was not clear to begin with. We had a trajectory, the event shaped by tiny, five-minute talks from each of the participants and a range of guest speakers, all talking about something that “blew their mind”, and leading into subsequent discussion. We had a few sessions where we raised topics we felt relevant to the discussion of play and games, and as the Lab went on, definite themes emerged. And then, we would have to stop talking, and make things – tiny, prototype games to prove a point; collaborative rulsets in a session of Nomic; slowly putting what we “thought” and “believed” into practice. And then, from a practical session, back to discussion and analysis. The term “Lab” eventually proved to be the most succinct explanation of affairs. It was a space that encouraged both exploration and experimentation, not favouring one of the other, and definitely emphasising the value of thinking through making. By the end of the three days, we’d designed about two-and-a-half games each, and explored countless others. Nothing focuses the mind like having to put your discoveries and beliefs into physical, playable form. 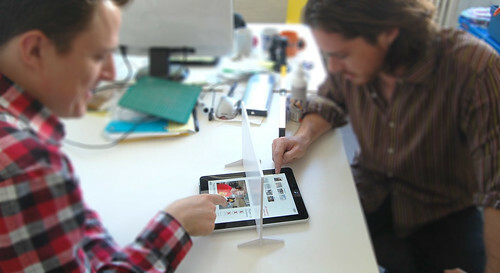 The Lab fostered a growing literacy of games, considering “literacy” as Alan Kay did – the ability to read and write in a given medium. Early on, we played a simple parlour game called Chairs: the goal being to stop a slowly walking player from sitting down on the last available chair by moving between chairs yourselves. It’s a simple game, and yet as a group, we were terrible at it. But after the initial burst of hilarity, we took it apart: what’s going on, why are we failing, what are the simple guidelines to ensure success. We were still lousy with our newly considered perspective – and I would love to build an AI simulation just to prove how dumb you can play to win the game – but we were beginning to understand our lousiness. And thus the Lab continued: talks, discussions, or games would be presented, taken apart, put back together. I valued being asked to prove or embody a belief; the test was not to succeed, but merely to try. What did I actually get out of it that I can explain in a concrete sense? One overriding theme was the ethics of game-design. It’s a huge topic, especially in this post-Jesse-Schell universe, and we explored it very thoroughly in some of the sessions. By the end, we’d designed both a game you could only lose, and a game where everybody would win. We created rules that were, in the real world, entirely unethical, but within the closed system of the game we were playing not only ethical but effectively irrelevant. We considered ethics of structured, rule-based play – games themselves – versus the ongoing act of unstructured play. This is, I guess, what Matt J has previously described as toyetics – it’s the fun you can have with a system, the ways it affords non-structured play, the ways it encourages you to interact with other people in a social capacity. It’s the fun you can have just playing. Games aren’t just rules – they’re rules you can play with, and the best games often afford the best play. Game arises from play. A ruleset crystallises a set of actions distilled from an experience of play. That crystal can be popped in your pocket to be played with again and again, any time, any place, with anyone entranced by its sparkle. It gets chipped and scratched, then rubbed and polished… the very best thing about it is that if we want to, we can smash it up and grind it into paste to make believe anew. Make Believe, by Jimmy Stewart (by Tassos Stevens). What we were doing at the lab was learning how to make games arise. The game we eventually presented, to a small invited audience, was Couple Up: a site-specific parlour-game, based on getting the guests invited at the final session from one room (where they were socialising) to another (where there was booze). 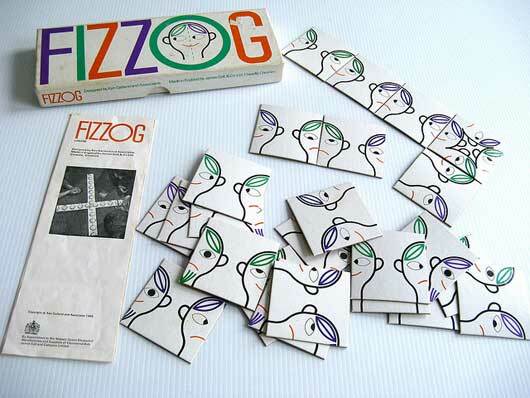 It used cards as a social token, but the game was played in conversations between players. From the video above, it might seem slight, and whimsical; it’s certainly a little bit broken, and needs some revisions. But at it’s core are a few things we wanted to explore: designing ethical games; designing games that forced you to learn to “read” them; games that afford performance; games that exploit hidden knowledge (both on the part of the players and game-makers. That explorations happened not only in the making, but also in watching our guests play the game, and subsequently discuss it with us afterwards. The standard of discussion and quality of the participants and speakers throughout the lab was fantastic. The fact we were reigned-in, asked to stop taking and start explaining ourselves through making, was an important challenge, and a visible reminder of the value of thinking through making. And, of course, though our subject matter was play through the lens of games of all forms, I can already see the ways many of the lessons I learned apply to my work in design. 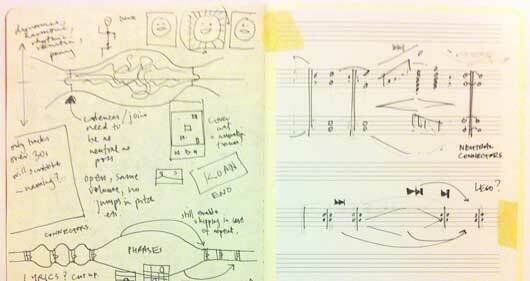 Some of the output of the Lab was very immediate – new colleagues, new ideas to take away. Some of it is lodged into my brain, not taking form right now, but burning away, and will no doubt nag me for the rest of the year. It acted like so many of my favourite conferences – not a reminder of things that I’ve failed to do in my work, or things that have to change immediately, but things to be thinking about in the long term, and to be incorporated into future output. 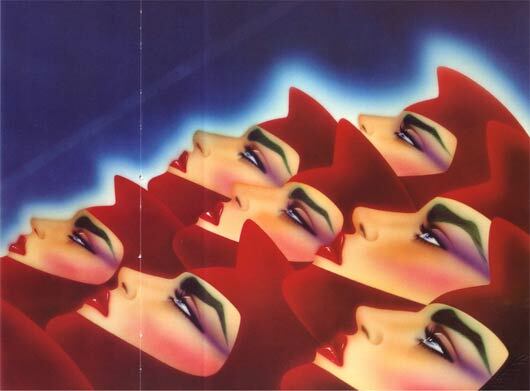 Not One Big Idea, but a hundred ideas, percolating away, growing and mutating until they’re ready to use. I’ll be making use of what I learned in so many projects, and so much work, from here on out. As such: it was a privilege to take part; thanks to Margaret, Miranda, Alex, and everyone at Hide & Seek who organised the event, not to mention LIFT and the Jerwood Foundation for their support – and, most of all, to the other participants, who all brought something wonderful to the mix. 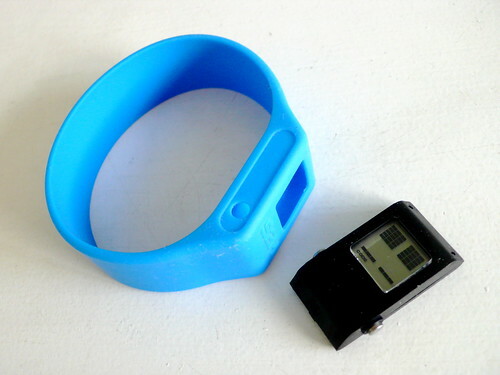 it feels way more like the future than the fitbit because it’s cheap, fashiony and simple. The Replay is $20. It doesn’t need any connectivity to share your fitness scores – a code appears on the Replay’s screen and you type it into the S2H website. It makes a smiley face when you’ve done enough exercise. And that rubber bracelet is clearly designed to be replaced/customised/given away as a freebie. Russell’s post has lots more detail and insight. As well as the device, I liked Russell’s use of “fashiony” as a watchword: something that feels fun and now and a little bit pop. Or to use a metaphor: the Replay isn’t Ikea, it’s American Apparel. For something like the Replay, I think that’s a good quality to have. Makedo looks like a fun take on construction toys: “a set of connectors for creating things from the stuff around you“. 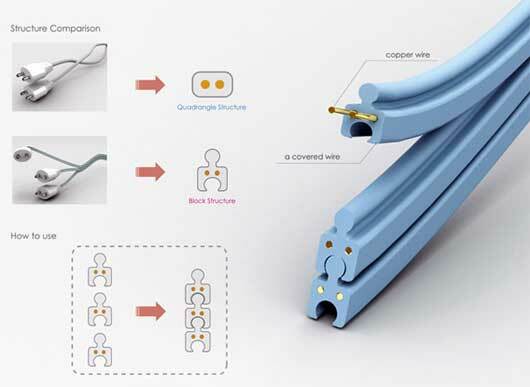 It’s a construction set made only of connectors and hinges; the raw materials are left for you to find. The video above has some good examples of its possibilities. My only doubt is if Makedo is toy-ish enough; the website makes it seem targeted more to an older, crafting audience. But there’s a charm and inventiveness in both the toy, and the play it enables, that I like, and I think that makes it worth a link. (Via Alice Taylor, who saw Makedo at the Toy Fair). I think this was my favourite thing I saw this week: a downloadable game for Nintendo’s DSi. The aim of the game is to find letters hidden in 3D scenes, styled a bit like a cardboard toy theatre, by tilting the device around. The video you need to see is the second one down on this page – I can’t embed it. It’s mindboggling: a game all about perspective and visual trickery, which looks utterly beautiful. Even more impressively: the DSi has no accelerometer, just two 640×480 cameras – so all that movement is being calculated through motion tracking. I was mainly taken with how beautiful it was, though. The only sad thing: I don’t read Japanese, I have no idea what it’s called. I hope it comes out in the English-speaking world soon. Anne Galloway linked to this great SEED slideshow of Victorian Microscope Slides. Finally: scratching and drumming with a set of holographic heads. (via Scott Beale). This is a live performance of Chris Cairns’ Neurosonics Audiomedical Labs inc, and elevates it from “nifty video effects” to something far more ingenious. It made me laugh, too. And this got me thinking about the ways that design and media can educate us about what future technologies might be like, or prepare us for large paradigm shifts. What sort of products really are “preparing” us for Augmented Reality? But when AR really hits, it’s going to be because the technology it’s presented through has become much more advanced; it won’t just be webcams and monitors, but embedded in smart displays, or glasses, or even the smart contact lenses of Warren Ellis’ Clatter. So whilst it’s interesting to play with the version of the technology we have today, there’s a lot of value to be gained from imagining what the design of fully-working AR systems might look like, unfettered by current day technological constraints. And we can do that really well in things like videos, toys, and games. 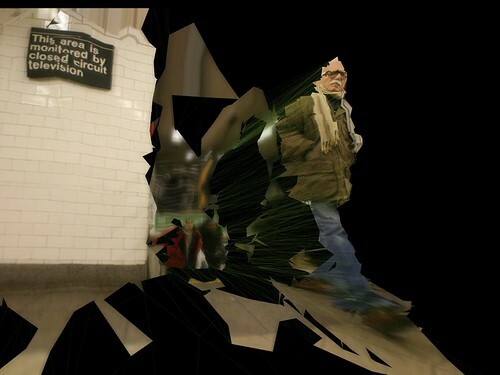 Timo’s video imagines using an AR map in an urban environment. I particularly like how he emphasises that there are few limitations on scale when it comes to projecting AR – and the most convenient size for certain applications might be “as big as you can make it”. Hence projecting the map across the entire pavement. This is perhaps a more exciting interpretation of what AR could be, and what AR devices might be (not to mention a working, real-world example): the iPhone becomes a magic viewfinder on the world, a Subtle Knife that can cut through dimensions to show us the information layer sitting on top of the world. It helps that it’s both useful and pretty, too. Dead Space has no game HUD; rather, the HUD is projected into the environment of the game as a manifestation of the UI of the hero’s protective suit. It means the environment can be designed as a realistic, functional spaceship, and then all the elements necessary for a game – readouts, inventories, not to mention guidelines as to what doors are locked or unlocked – can be manifested as overlay. It’s a striking way to place all the game’s UI into the world, but it’s also a great interpretation of what futuristic, AR user interfaces might be a bit like. This is Matt Jones playing with a Tuttuki Bako in our studio. 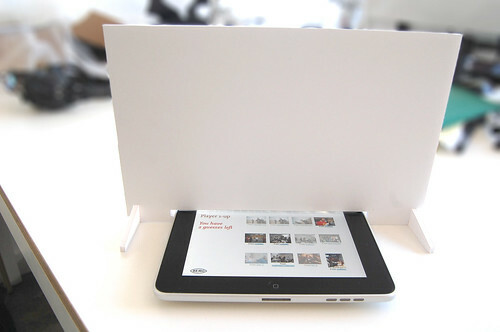 You place your finger into the hole in the box, and then use it to control a digital version of your finger on screen in a variety of games. It’s somewhat uncanny to watch, but serves as a great example of a somewhat different approach to augmented realities – the idea that our bodies could act as digital prosthetics. All these examples show different ways of exploring an impending, future technology. Whilst much of the existing, tangible work in the AR space is incremental, building upon available technology, it’s likely that the real advances in it will be from technology we cannot yet conceive. Given that, it makes sense to also consider concepting from a purely hypothetical design perspective – trying things out unfettered by technological limitations. The technology will, after all, one day catch up. What’s exciting is that this concept and design work is not always to be found in the work of design studios or technologists; it also appears in software, toys, and games that are readily consumable. In their own way, they are perhaps doing a better job of educating the wider world about AR (or other new technologies) than innumerable tech demos with white boxes.